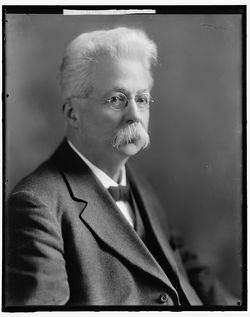 Clinton Hart Merriam had a successful career as a naturalist and as the first director of the National Biological Survey, but during his explorations in California, and certainly by the end of his career, his attention shifted almost entirely to the recording of the stories and ethnographies of Native Californians. Merriam was a critic of what he saw as the tendency for anthropologists to lump tribes into too few linguistic stocks and cultural families. He was a proponent of calling tribes by the name they called themselves, and he collected a volume of linguistic data on his travels. He advocated for making linguistic data readable to general audiences instead of only to linguistic specialists. He had the mind to go back and change language in his journals he later found to be offensive or derogatory. He was a very personable man, and his ability to develop many long-lasting friendships with the Native Californians he encountered is evident in his writing. 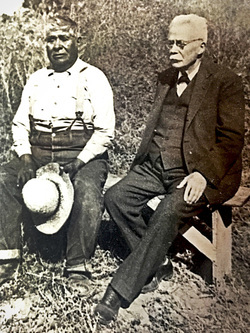 He saw the drastic impact that the changes in the state of California had on the native people living there, and he worried that the native cultures of California might disappear, which was a driving force in shifting his focus from biology to anthropology. Merriam was fascinated with Native American basketry and collected basketry throughout California and the West. His interest in utilitarian basketry makes his collection invaluable, as it represents types of baskets used in day-to-day living instead of basketry specifically made for sale. Of the 1050 baskets documented in his collection, he collected one-half of the collection between 1902-1903 and three-fourths between 1900-1904, making it a good comparative sample to see cultural variation in basketry traditions. His collection is incredibly unique for basketry collections of the time in that it was extensively documentation. In his journals and catalog cards Merriam not only often described the specimens in great detail, but also the people he purchased his baskets from, frequently citing them by name, making connections with oral and written histories possible. Merriam was a prolific writer, both in academia and in his personal journals. As they contain information on the basketry Merriam acquired, the UC Davis Department of Anthropology Museum curates a copy of his travel journals in California. To obtain your own copy of any of Merriam's journals, you can request them from the Library of Congress Duplication Services. As mentioned above, Merriam advocated for making linguistic data readable to general audiences. To carry on his legacy, the UC Davis Department of Anthropology Museum would like to make his writings accessible to the general public through a project to digitally transcribe his journals. To participate or partake in the project contact the museum or see the Transcription Project page. Scan of original negative. Library of Congress.